Q. How do I get invitations? A. 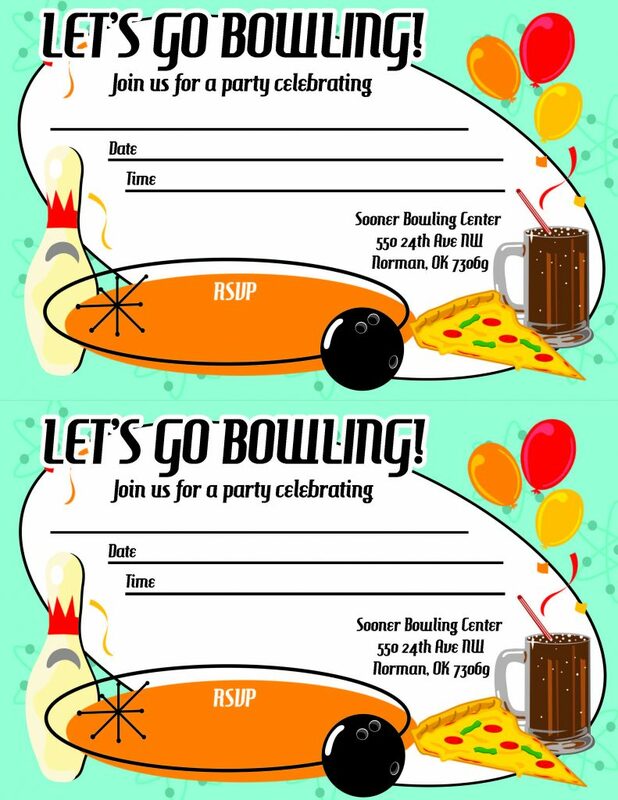 Our Bowling Center provides invitations and they may be picked up at the front desk during regular business hours. In fact, if you bring us your invite list, we will even mail them out for you! Q. What do I need to bring to my party? A. Our Bowling Center will provide everything for your party but the birthday cake! You may bring in cupcakes, a cookie cake or a birthday cake to celebrate the occasion. Q. Can I bring my own outside food and / or drink? A. With your birthday party booking only birthday cake is allowed, we provide the drinks for your party so please leave everything else at home and enjoy your cake, soft drinks or other items from our snack bar. No other outside food or drinks will be allowed in the bowling center. Q. What kind of decorations are provided and can I bring in my own products? A. We provide your party with fun, colorful birthday themed plates, cups and napkins as well as a birthday balloon bouquet attached to a decorated bowling pin. Enough paper supplies are provided for the number of lanes you have reserved. If you have a theme and would like to bring your own decorations, we ask that you bring them in by the Friday prior to your party so our hosts have time to set the up with the party. Q. How long is the party? A. You have the lanes for 1 hour from your party start time and the party room for the next hour for a 2 hour party in total. This includes bowling, eating pizza (if ordered), cake and opening presents time. If you have extra time, our world famous Party Hosts will play age appropriate games with the kids. As other parties are scheduled after yours, we ask your cooperation with our staff cleaning up your party area to prepare for the next celebration. Q. Once I have my party booked, what do I do? Q. Is there a cost for others to be added to the party or what if adults want to bowl too? A. 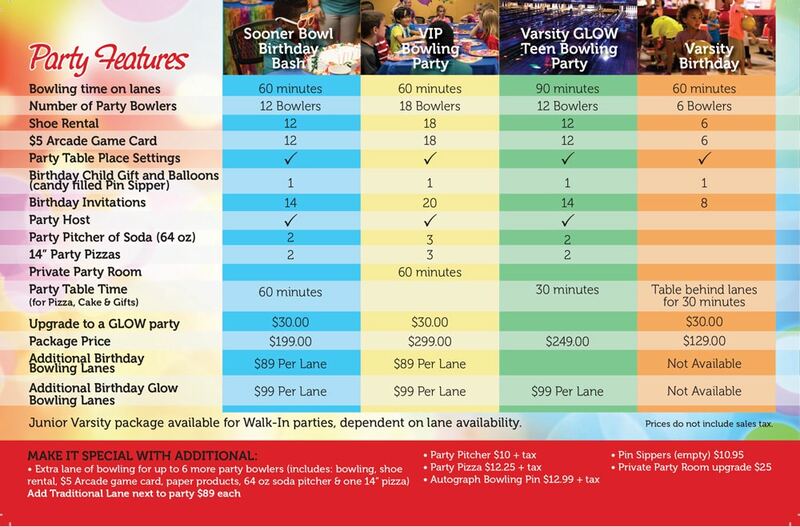 Your party package includes bowling and products for up to 12 bowlers so anyone may bowl up to 12 people. If you want to add a lane to your party the charge will include the bowling and the rest of the package for up to 6 bowlers per lane. 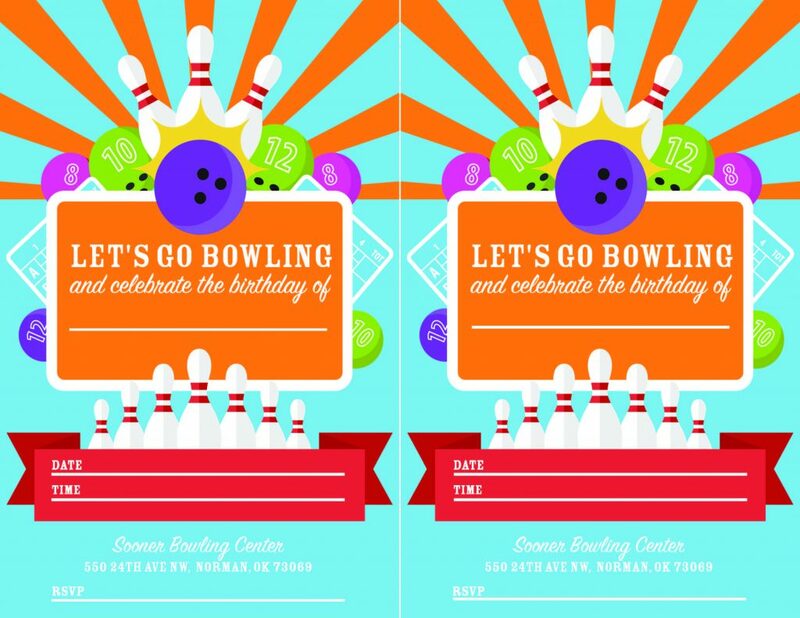 *NEW* Book a birthday party for your child at Sooner Bowling Center and conveniently pay the deposit online! Please book a package in the center or over the phone with us BEFORE paying your deposit online so we can ensure availability. A deposit of $50 is necessary to reserve the date/time of a party. Deposit is due by the Monday of the week your party is to be held, and if booking during the week of the party due day of booking. Your deposit will apply to the party total. Deposits can be made via online with a credit card or in person by check or credit card with a Manager or Party Coordinator. If for any reason you need to cancel or reschedule the birthday party at least 48 hours in advance, your deposit may be applied to a reschedule, or refunded on a gift card. Parties cancelling less than 48 hours prior to party time may either reschedule party date (if due to family situation, illness, extreme situations) or forfeit the deposit if cancelled or if no cancellation is given (no show).